It took me way too long to get around to wearing this polish after nabbing it from a blog sale. Butter LONDON Knackered had been on my wishlist for awhile, though I had no idea what the name meant. It prompted me to look into British slang, and in that way I found that it means basically means exhausted. Cool! British slang is fun! And so is this polish. I have to admit that I was knackered when I did my nails. I used one coat of Wet 'n Wild Black Creme as my base (yes, it really is good - my first time trying it), and one coat of Knackered over top. I didn't do my best work with this manicure, and I didn't realize how sloppy it was until it showed in the macro shots... yikes! Butter LONDON Knackered has a thin consistency that dries pretty fast. I think it would have looked better with either two coats or a thicker, better-applied coat. Even so this polish is super gorgeous, looking the most stunning in low light when it's holo microglitter sparkles like crazy and it has more of a blackened smoldering effect. The purple-to-green shift this polish has is awesome. It also shows pale blue in the bottle but I don't really see that on the nail. I believe that is just from the sheer tint of the polish. If I use Knackered alone it would look more grey-blue, and not have such a strong color shift. The sparkle reminds me of China Glaze Fairy Dust very much. 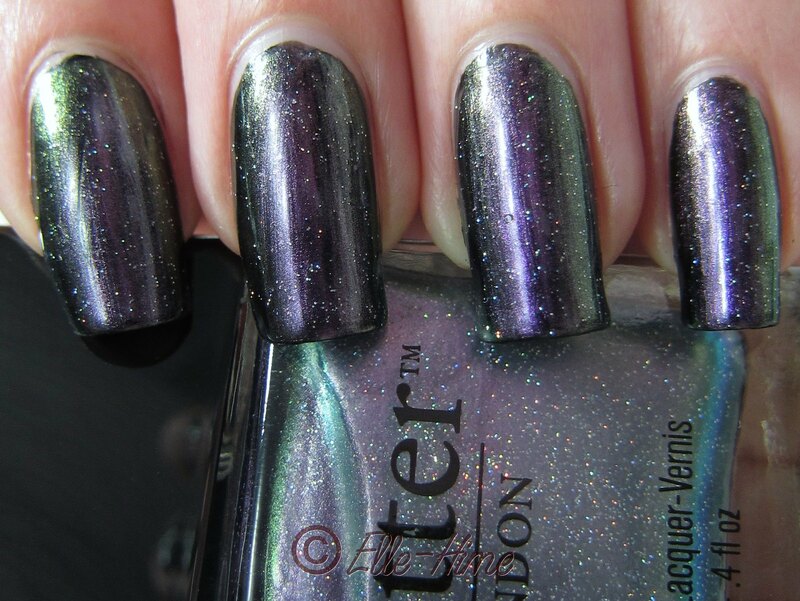 I expect you could create a similar manicure just by layering Fairy Dust over your favorite duochrome polish. I loved wearing Knackered so now I'm inspired to create other versions of this manicure through layering. What do you think of it? I love it! I've been meaning to do this on my nails for practically forever and just haven't gotten around to it. Thanks! Yep, that's exactly what happened with me! It's so pretty, though. You'll love it! 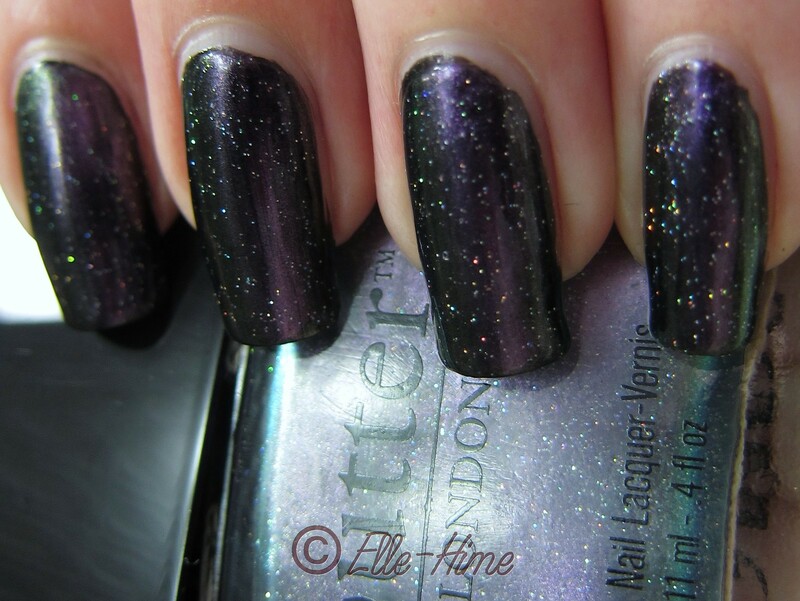 This is absolutely gorgeous.It looks like there's a galaxy on your nails. Love it. Thanks! It made me think that too and my husband said the same thing! I wish Butter London wasn't so expensive. I've been looking for a safer nail polish and Butter London has some fantastic colors and the packaging is cute. The art you did here looks amazing...your nails are so long! I have to agree! I'd own more if they weren't out of my price range. So I was happy to pick this one up secondhand!